Another busy month, another late unboxing. This months box was special nonetheless, because it's been over a year since I've been subscribed to the Glossybox. 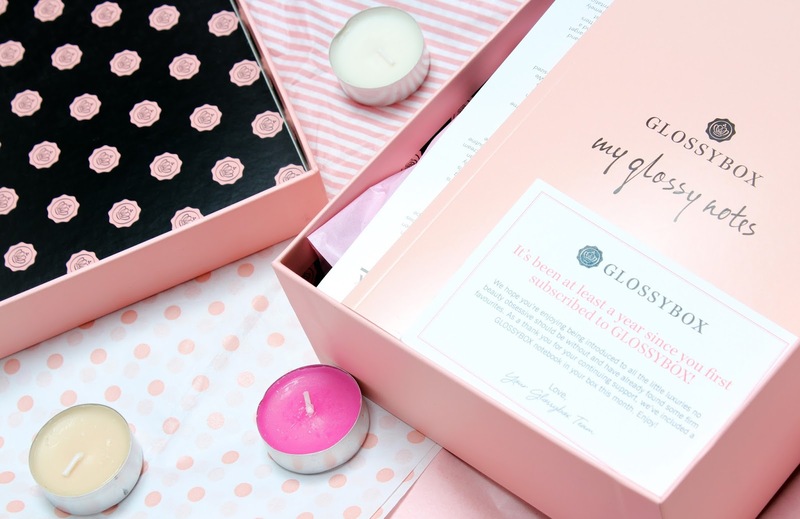 Here's a throwback to my first ever Glossybox. 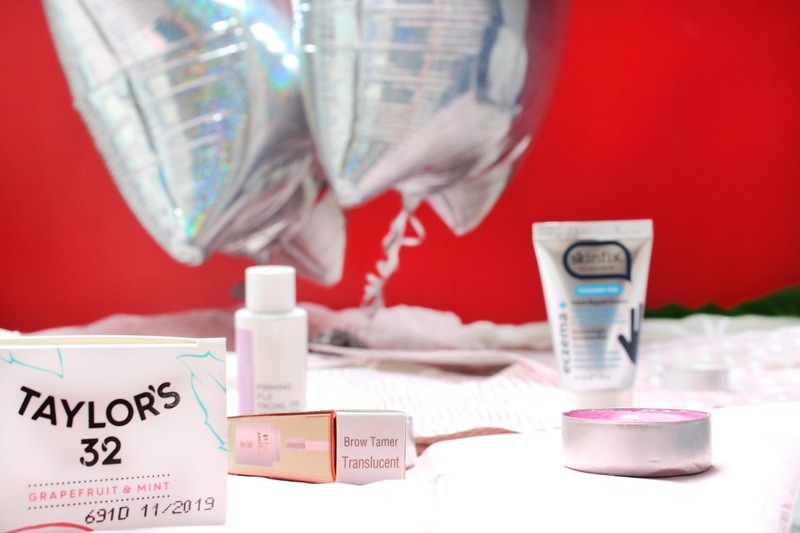 It's been such a great experience trying out new products every month and finding new favourites. I'd definitely recommend it to everyone, even if you just try it for a month. Before I started using Glossybox, I never even heard of brow tamers. What does it actually do? Well, it's basically like hairspray for your brows. After getting that perfect shape, brush some brow tamer through them and I promise you they'll stay there all day! I also really like the feathered brow trend and sometimes I'll just use this to brush my hairs up without putting any other product through it. It looks like you made some effort even though you didn't actually do much. The hype has come and gone. Another random Instagram craze, the siligel blender. I've watched plenty of Youtube videos of people trying it and I've had mixed feeling about it because of so much criticism on it. When I saw it on the sneak peak last month, I was really excited to try it nonetheless and see what I personally think about it. Turns out it it really bad. It doesn't apply things evenly, as if creating this patch on my cheek. The worst area was applying near the nose and eyes. With the sponge I can just bounce it on my nose and over my eyes, it's just nice that it does it all. Don't think I'll be using this one again when I can grab a sponge and apply my foundation so much quicker. I love a bit of skincare. Oils, Serums, Eye Creams... love them all. It's so relaxing to get home at the end of the day, take off makeup and just do your skincare routine. Oils are such a great way to get the moisture in. If your skin is on the dry side using oils in your cleansing or moisturising can really benefit you and give you that extra oomf. I love how this oil feels on my skin too, it not too greasy which can feel really heavy on your face. The smell is also really refreshing. Perfect timing! I've had eczema for quite a while now and it's honestly the most annoying thing ever. Luckily mine tends to come and go and it's not that severe but when it hits you, the itch never stops. I've been using this cream just before I go to bed and it has definitely soothed the itch. The skin isn't as flaky anymore, it's really given the skin that moisture bomb. Absolutely love this and I didn't think I'd ever be saying that about a tooth paste. It's just something that you need, not something you look forward to. For the first time I've been looking forward to brushing my teeth. The hint of grapefruit in the toothpaste leaves this great after taste in your mouth. And the whitening really works. I drink a lot of coffee so I always get staining on my teeth and this tooth paste really lifted all that. I've definitely noticed that they're whiter however I must say that it comes and goes. Mid way through the day they don't seem as white as they did before coffee, breakfast and everything else that I eat during the day. Nonetheless, I still like the aftertaste of it.